Weather: The National Weather Service predicts rain showers through the weekend with temperatures in the mid 40s to low 50s. Sports: Boys swimming hosts Ingraham at 3:30 p.m. Boys basketball plays North Kitsap at 3:45 p.m. in the Commodore Gym. Girls basketball plays South Kitsap at 7 p.m. in the main gym. Wrestling travels to Kingston on Saturday for an 8 a.m. match. Looking for a “loverly” night out? 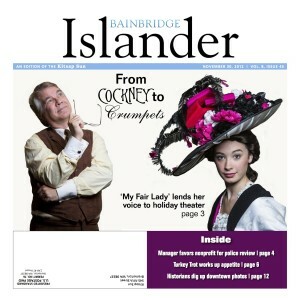 Ovation!s’ “My Fair Lady” opens tonight at the Bainbridge High School Theater. 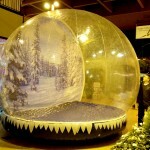 The show continues through Dec. 16; 7:30 p.m. Fridays and Saturdays and 3 p.m. Sundays. Two holiday tours return to the island this weekend. The Winter Studio Tour marks its 29th year with more than 70 artists in 10 venues. The tour runs 10 a.m. to 6 p.m., Friday through Sunday. Christmas in the Country also runs Friday through Sunday. Hours are 10 a.m. to 5 p.m., Friday and Saturday, and 11 a.m. to 5 p.m. Sunday. Bainbridge Brewing Company will be featured in the debut edition of “Cruising Kitsap,” a BKAT show highlighting popular hangouts around the county. “Cruising” premiers at 1 p.m. Saturday and can be seen at 8 p.m. Tuesdays. To suggest venues for upcoming shows, email cruisingkitsap@gmail.com. In case you missed it, a costumed crowd turned out for the Thanksgiving Day Turkey Trot last week. About 4,300 homes in the Winslow area mysteriously lost power Tuesday morning. City Manager Doug Schulze recommended an assessment of the police department by an outside law enforcement group. The City Council concurred Wednesday. Islander and Olympic medalist Emily Silver will be inducted into the Pacific Northwest Swimming Hall of Fame this weekend. A baby girl named Lucy was born aboard a ferry midway between Bainbridge and Seattle on Thursday afternoon. No word yet on whether her middle name is Tacoma. Coming Up: Bainbridge Weed Warriors are educating the public about the dark side of a popular holiday decoration. A 27-year-old Poulsbo man was arrested after a passerby witnessed him fishing cash out of a pay box at a parking lot near the ferry terminal. The man was holding money in both hands when police approached. He told the officers he was getting ready to pay for parking, but abandoned that story when he realized police had a witness. Police found heroin syringes in the man’s car. Also this week, a bag of marijuana was discovered in a baseball field dugout and two Suquamish drivers collided on North Madison Avenue. History: Developer John Green’s deep love of Sparkman & Stephens sailboats led to this road’s name. The company was founded 75 years ago when self-taught sailor Olin J. Stephens went into business with yacht broker Drake Sparkman. Twenty-one-year-old Stephens shared a passion for naval architecture with his brother Roderick. Rod worked at the legendary Nevina Yard in City Island, New York, and was key in helping Sparkman & Stephens survive the financial storm of the Great Depression. Since its founding, Sparkman & Stephens has completed more than 2,600 designs, four of which are also Bainbridge street names: Bolero Lane, Charisma Lane, Intrepid Court and Yankee Girl Lane. All four designs are yacht cup winners. Civic-minded islanders have a busy dance card tonight. They can choose between a potluck and discussion with new City Manager Doug Schulze or a Washington State Ferries community meeting. p.m. at OfficeXpats in the Bainbridge Pavilion. The conversation will include opening remarks by the city manager, a moderated discussion and a Q&A session with the audience. The event is free but attendees are encouraged to bring a dish to share and a $5 donation. 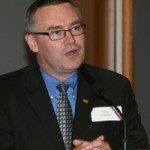 A standing reception will follow the discussion at 8:30 p.m. Schulze (pictured) joined the city on Nov. 5. He previously served as manager of Normandy Park. Another meeting will take place across town at the same time. 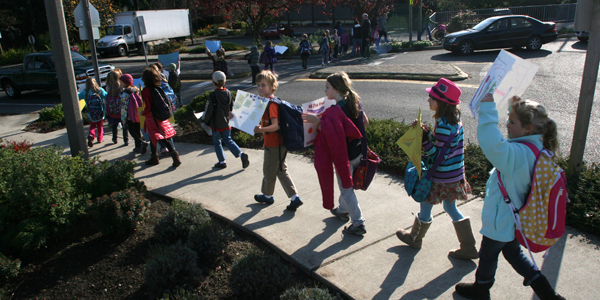 WSF brings its traveling community outreach tour to Bainbridge at 6 p.m. in the Art Museum. Ferries chief David Moseley will discuss the upcoming legislative session, staffing issues and other topics. 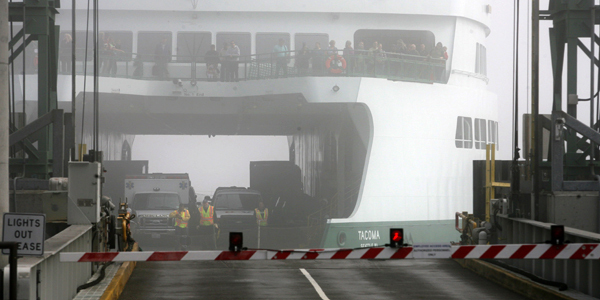 This is a good time for ferry riders to bring forward questions and complaints. 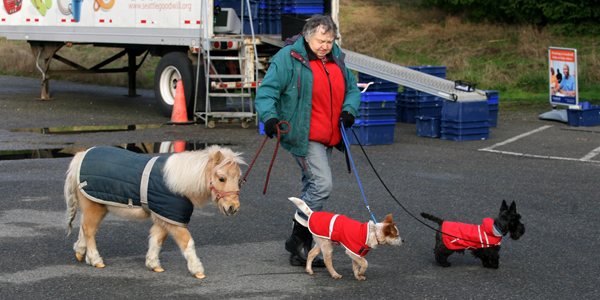 WSF already held a meeting in Bremerton, where proposed service cuts are a hot topic. 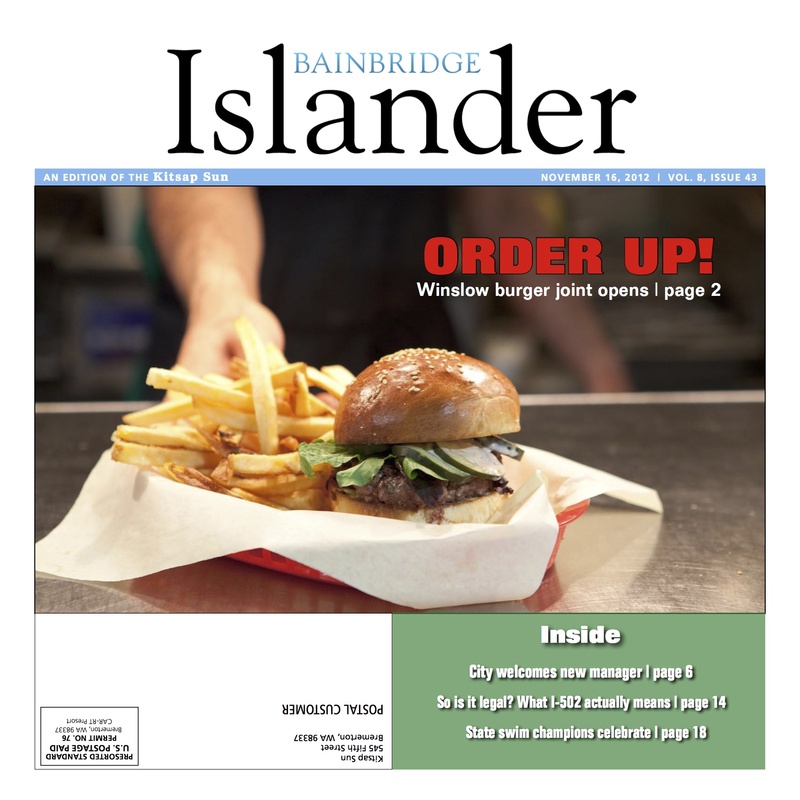 A 23-year-old Bremerton man told police he was on his way to get a burger from a Bainbridge drive-thru when he was stopped for speeding and driving erratically on Highway 305 on Nov. 16. The man was booked into Kitsap County jail for drunken driving, and an extraditable felony warrant out of Colorado. Also this week, graffiti sprayed on an island school appeared targeted at administrators, and a motorcyclist was hospitalized after colliding with a deer. Location: Runs north-south between Wyatt Way and Shepard Drive. History: John Cosgrove lived on the Sound for two decades until evenutally meeting his end thanks to a bunch of bananas. When he arrived in 1858, Cosgrove claimed a plot near Port Madison and began working at the local mill. Eventually, he sold the claim to the mill’s owner. His price: the steamer Mary Woodruff. Now a captain, Cosgrove set sail. Known as “Humbolt Jack,” he lived with a Native American woman and their children. One day Cosgrove visited a Port Blakely blacksmith shop carrying a bunch of bananas. He wanted to hang the fruit from the ceiling to ripen. While standing on a chair, Cosgrove lost his footing and fell to the floor. Sources: “Port Madison, Washington Territory, 1854-1889,” Fredi Perry. Perry Publishing, Bremerton, 1989. Weather: “A major change in the weather is coming this weekend,” the National Weather Service warns. The first in a series of winter storms is predicted to arrive tonight or Saturday morning, with heavy rain and wind expected. Sports: Bainbridge swimmers capped their season with three state titles, taking second as a team. The winter sports season begins after the Thanksgiving holiday. Call it Green Friday. 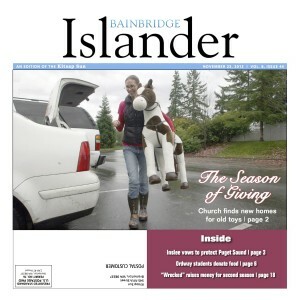 A gift exchange hosted by the Bainbridge LDS church celebrates recycling and reusing. It begins this evening, when islanders can drop off lightly used items for re-gifting from 4-9 p.m. People who drop off items receive credits. They can return between 9 a.m. and 12:30 p.m. Saturday to “shop” for other people’s re-gifted items. The church is located on Madison Avenue, next to Ordway Elementary. See full gift guidelines here. Northwest musician Gary Stroutsos performs improvisational flute music and Native American stories at 7:30 p.m. tonight at Bainbridge Performing Arts. Tickets are $12 for adults. The performance coincides with a display of native art on featured at BPA through the end of the month. Bainbridge Island Youth Orchestra presents its free fall concert from 7-8 p.m. Saturday at Island Church, 9624 Sportsman Club Road. 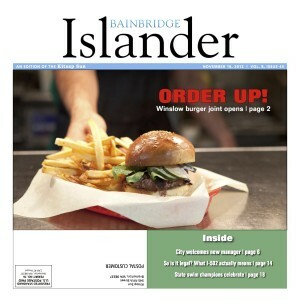 Inside the Islander: A “Soup’r” new restaurant opens in the Pavilion. Harrison Medical Center announced the purchase of a Bainbridge property. The Bremerton-based hospital plans to open a 13,000-square-foot urgent and primary care clinic on the island in 2014. A Bainbridge man was sentenced to 44-years in prison for menacing Port Orchard officers with a firearm. Nearly $300,000 was stolen from a Bainbridge man’s bank account in an apparent case of identity theft. An islander is interested in taking over management of the troubled Bremerton Marina. Coming Up: The City Council meets Monday instead of Wednesday next week because of the holiday. Have a safe and happy Thanksgiving week. If islanders are perturbed by a proposed new vehicle registration fee, they didn’t show it Wednesday. A hearing on a resolution creating a charge of up to $20 per vehicle to support road work drew no attendees to City Hall on Wednesday evening. The Transportation Benefit District board — made up of City Council members — did not vote on the proposed fee. Instead, a vote may come at the district’s Dec. 5 meeting. A few islanders have spoken out for and against car tab fees at past meetings. Some believe the charge is a fair way to raise money for badly needed road repairs. Others, including car collectors, say it would unduly burden households with multiple vehicles. The city estimates a $20 fee would generate $330,000 each year for road projects. The full draft resolution can be read here. An unknown person used a 69-year-old Bainbridge man’s personal information to wire nearly $300,000 from the man’s bank account to an account in China on Nov. 5. The man said his bank would reimburse him for the money once he filed a fraud affidavit. Also this week, a 67-year-old man admitted to “beating up” his friend for not allowing him to sleep over, and a possible Halloween night child luring attempt was reported on Weaver Road. History: In 1841 Captain Charles Wilkes found himself on the Puget Sound, leading the United States Exploring Expedition. The expedition was the result of more than a decade of political debates and personal conflicts. Finally, with the support of Congress, six U.S. Navy ships left Norfolk, Virginia, on August 18, 1838. On board: 424 crew members and nine scientists set to explore the South Pacific. 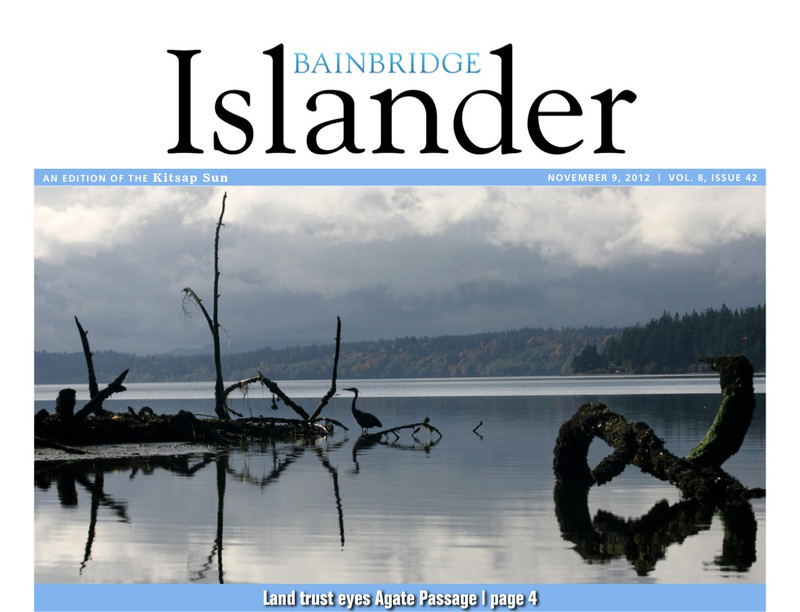 After almost three years of sailing, the expedition reached what is now Bainbridge Island. There, Captain Wilkes dubbed the waterway separating the island from the peninsula the Agate Passage. The name was in honor of artist, Alfred T. Agate. Only 26 when the expedition set sail, Agate traveled around Cape Horn, throughout the South Pacific, to the Antarctic, and, of course, along the Pacific Northwest. Agate’s contributions to the expedition extended beyound detailed drawings and portraits for the crew. He also documented shipboard life and scientific discoveries with much of his work still celebrated today. After four years at sea, Agate returned home in 1842. Shortly after he married Elizabeth Hill Kennedy. Unfortunately, only four months after their marriage, Agate died. His health had suffered from his various expeditions and he eventually succumbed to tuberculosis on January 5, 1846. He was 33. Agate’s name, however, is remembered throughout the island he first helped document all those years ago. 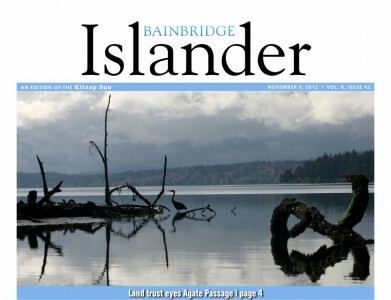 Sources: “Picture Bainbridge,” Jack Swanson. Bainbridge Historical Society, 2002. “Bainbridge Through Bifocals,” Elsie Frankland Marriott. Gateway Printing Co., 1941. “A History of Bainbridge Island,” Katy Warner. 1968. Weather: Our string of cold clear days should continue through Saturday, with highs in the mid 40s and near-freezing temperatures at night, according to the National Weather Service. A chance of rain is predicted for Veterans Day, with rain likely Sunday night. Sports: Bainbridge is well represented in the girls state swimming championships, which begin this afternoon in Federal Way. Senior Sarah Grundman looks to defend her 500-yard freestyle title. See a full sports schedule here and follow the Sun’s PrepZone page on Facebook for updates. The public is invited to help the Bainbridge Island Special Needs Foundation celebrate the 10th birthday of Stephens House from 4-7 p.m. Saturday in the Boys & Girls Club space at the Bainbridge Aquatic Center. There will be a DJ, refreshments and cake. Bainbridge Symphony Orchestra launches its 40th season this weekend with performances of Tchaikovsky’s Fifth Symphony, accompanied by other works. Concerts are 7:30 p.m. Saturday and 3 p.m. Sunday. Mezzo soprano Sarah Mattox will also perform. The city welcomes new manager Doug Schulze and his family to the island at 3 p.m. Sunday at City Hall. The city is also launching a food drive for Helpline House in conjunction with the event. Donations will be accepted Sunday through Nov. 17 at City Hall and other participating locations. Helpline House is organizing its own three day food drive Nov. 15-17. Inside the Islander: See a roundup of local election results and learn about the history of Agate Point and its many roads. The state and federal government are studying how to remove 1 million gallons of creosote and other chemicals from the Wyckoff Superfund site. Former Bainbidge High teacher Rory Wilson safely guided his experimental boat into Hawaii last week. Bainbridge Island Land Trust must decide by December whether to purchase 12 acres on Agate Passage. Bainbridge Democrat Jay Inslee took a solid lead in the governor’s race Tuesday, but opponent Rob McKenna has yet to concede. Island lawyer Sheryl Gordon McCloud was elected to a spot on the state Supreme Court, while fellow island lawyer Karen Klein fell short in her bid for a county Superior Court position. The election resulted in no change to Bainbridge’s representation in Olympia. Coming Up: A public hearing on a potential new car tab fee is set for 6 p.m. Nov. 14 at City Hall.